As I begin this post, it is the feast day of Saint Pelagia (October 8). In honor of the famed Antiochene actress and prostitute (known around Antioch as Margarita because she wore expensive pearls and jewelry), I decided to reread her hagiographical vita. A deacon named Jacob or James wrote of her fifth century CE conversion and baptism; abandoning the life of being an actress and prostitute in order to be a “bride of Christ.” There are a number of interesting points about the saint’s life. The first is that the tale includes a deaconess named Romana, who serves as evidence of the existence of women as clerics in many early Christian churches. The second is the fact that the Bishop Nonnus gives Pelagia his hair shirt and a woolen mantle in order to sneak away into the night dressed as a man. She became a well known ascetic and hermit on the Mount of Olives, though people believed her to be a monk named Pelagios. Pelagia is just one of many crossdressing saints from the early Christian hagiographical tradition, and represents the boundaries blurred both by prostitutes and by crossdressing in antiquity. 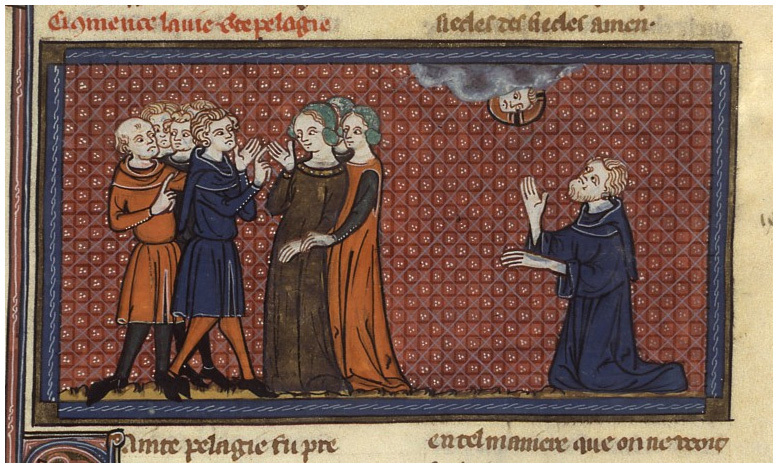 Pelagia and her harlots depicted in a 14th century manuscript. Français 185 , Fol. 264v Vies de saints, France, Paris, XIVe siècle, Richard de Montbaston et collaborateurs. (Image via Legenda Aurea). Crossdressing was nothing new in the ancient Mediterranean–and the act included both men and women. Plutarch’s Life of Alcibiades, the late 5th c. BCE Athenian statesman, emphasized his feminine proclivities. In a story about his childhood, Plutarch (Alc. 2.2) recounts that in a wrestling match, Alcibiades bit his opponent. The opponent yelled: “You bite, Alcibiades, as women do!” To which he responded: “Not I…but as lions do.” Female lionesses are the ones that hunt, so this was a rather apropos comeback from the witty Alcibiades. Another ancient author remarked that Alcibiades regularly attended symposia disguised as a woman. This idea is also seen in Plutarch, who noted that while with Timandra, his mistress and a courtesan, Alcibiades dreamed he was placed in her clothes and her makeup put on his face (Alc. 39). Not long thereafter, Alcibiades was killed and his corpse wrapped and buried by Timandra in her own clothes. The harlot’s actions would feature heavily in Shakespeare’s Timon, written 2,000 years later. 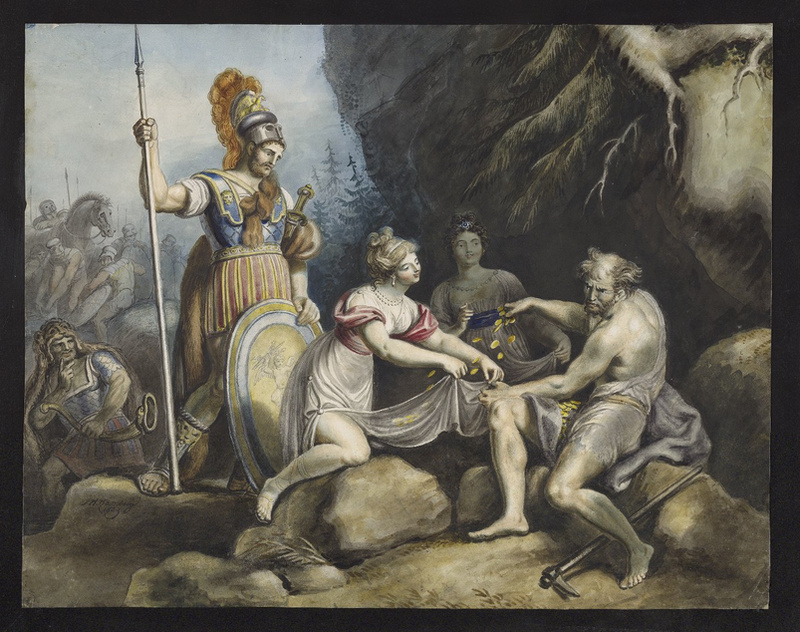 Timon of Athens, IV, 3, Timon giving gold pieces to Phrynia and Timandra by J.H. Ramberg, 1829. (Photo via Cornell University Library). 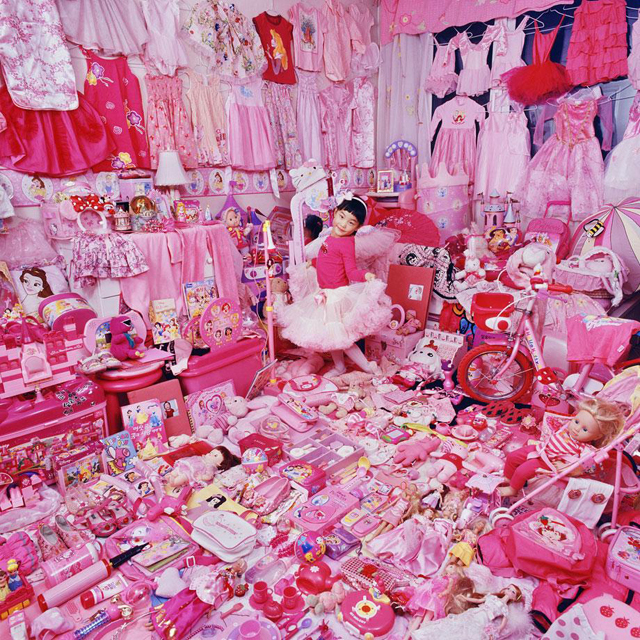 “The Pink Project” Jeeyoo and Her Pink Things, 2007 by JeongMee Yoon (Photo via ReShareable TV). The passage tells us a great deal about ancient gendered clothes, colors, and objects, and the anger sometimes felt by those who could not categorize another. Although largely positive, I think we all can reflect on the fears and anxieties expressed in the negative things written about Caitlyn Jenner for a modern example of this misplaced anger. I am impressed and supportive of our increasing acceptance of transgender persons within our society, but such hate speech existed both in antiquity and today. Red figured attic cup of a hetaira and man [500-490 BCE] (Image via the British Museum). The most infamous case of cross dressing came in 62 BCE. The rascally Clodius had fallen in love with Caesar’s wife, Pompeia, and infiltrated the all-female religious rites of the Bona Dea in order to commit adultery with her. Once again, we see a link in the classical literature between crossdressing and sexual deviance that is undeniable. It was always rumored that Clodius hung around with morally degraded people, such as prostitutes (cf. Cic. Mil. 55) and during the Bona Dea, he dresses as a woman in order to cross a number of boundaries: gender, religious, marital, and otherwise. If we return back to the late antique period and our dear Pelagia, we can see a shift in the textual depiction of crossdressing within early Christian literature that is in stark contrast to most classical writing we have reviewed. As Kristi Upson-Saia has remarked, “[Hagiographical authors] absorbed the transgressive dress performance into their narrative not to uphold it as a model for readers to follow but rather to control, domesticate, and harness the dress practice, as well as claims of radical gender transformation, that were troubling them” (2011: 85). Upson-Saia rightfully points out that saints like Pelagia were meant to put on “masculine virtue and spiritual progress” through men’s ascetic clothing, while still retaining their female bodies (2011: 101). 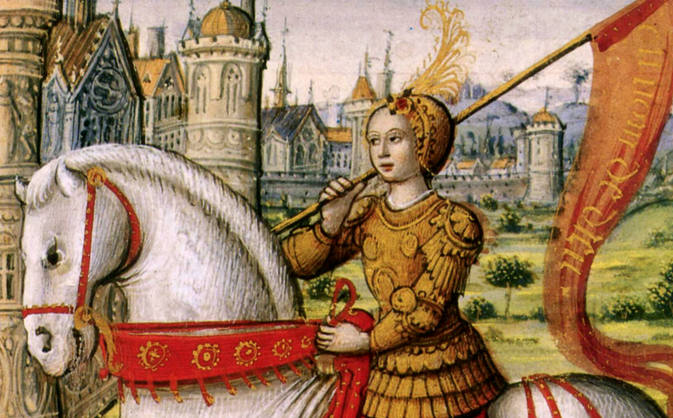 Joan of Arc depicted on horseback in an illustration from a 1505 manuscript (Image via Wikimedia). To early Christians, certain masculine pieces of clothing (e.g. armor, the hair shirt) communicated strength and spiritual potency–but only if the body underneath was first dedicated to Christ. Consequently, allowing female saints to wear such articles was a way to advertise the virtuous characteristics they now embodied. I would venture that this rubric allows us to better understand depictions of Joan of Arc and later female saints as well. The trick here is that chastity had to be vowed along with the male garments in order for the crossdressing to be viewed positively. 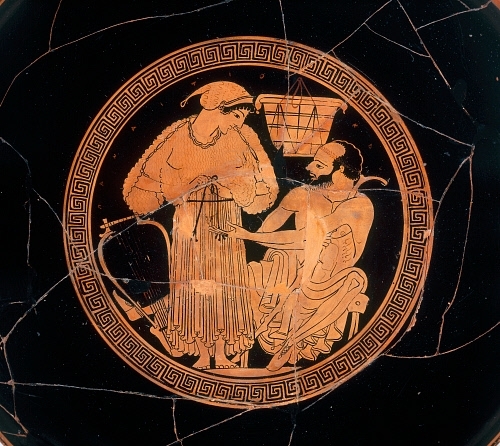 While I personally do not believe that clothing should be connected to any gender, it is interesting to reflect on its use in antiquity. Depending on the color, the context, and the individual’s sexual nature, crossdressing could announce myriad messages. I’ve long thought that Joan of Arc was probably transgender by modern standards (to the extent that we can understand what such a thing would mean to people that far back). It’s interesting to imagine that someone like Pelagia or Thecla might be so as well. Thanks for the post!